Student safety is a top priority for Harbordale administration, staff, and parents. 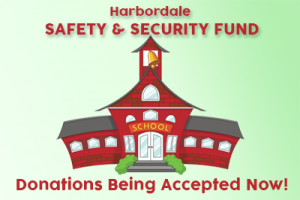 In an effort to address some pressing concerns, donations are now being accepted for safety and security efforts at Harbordale Elementary. Two immediate safety goals are planned to be addressed. The first is to pay for a buzzer system for the front door. With a buzzer system, the front office will be able to control exactly who enters our campus and when. The second goal is to put some sort of camouflage on the fencing around both playgrounds. With covered fencing, people passing by will not have a direct view of the children. After these two goals are reached, Harbordale administration will determine the next security concerns to give high status. If these or other security measures are important to you, please donate to the Harbordale Safety and Security Fund. No amount is too small or too large! Click the button below to be taken to our donation form. Be sure to indicate your donation should go toward the Safety & Security Fund in the targeted donation field. Any questions about security measures or security donations should be directed to Jennifer Kashdin, Harbordale Vice Principal at jennifer.kashdin@browardschools.com.